Blossom Hill Glass & Shower Door specializes in custom design, fabrication	and installation of unique glass applications, heavy glass shower enclosures	and precision fit mirrors. We provide our customers with expert and professional	service in both the commercial and residential. We would be happy to provide you with a free estimate. Just give our office a call at 408-629-7500 and our friendly customer service representatives will be happy to set up your estimate appointment. 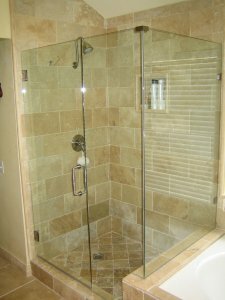 Blossom Hill Glass & Shower Door specializes in custom design, fabrication	and installation of unique glass applications, heavy glass shower enclosures	and precision fit mirrors. We provide our customers with expert and professional	service in both the commercial and residential fields. Just give our office a call at 408-629-7500 and our friendly customer	service representatives will be happy to set up your estimate appointment. Those who enjoy surrounding themselves with the finer things in life can	truly appreciate the effort it takes to achieve perfection in exterior	and interior design. Blossom Hill Glass & Shower Door is dedicated to helping you achieve	that perfection by creating exquisite atmospheres using the finest quality	products and superior workmanship. We are a service oriented company that	specializes in expert installation of custom glass applications, heavy	glass shower enclosures and custom mirrors designed to your personal preferences	and needs. Our company takes great pride in the sixteen years of service	we have provided for our customers in the San Jose and Santa Clara County	areas. We offer free of charge, on location consultations with our creative	installation professionals. Our highly skilled craftsmen will install	your custom designed products and installation will be completed in a	timely manner with customer satisfaction completely guaranteed. Experience	for yourself the exceptional service that has earned Blossom Hill Glass	& Shower Door a reputation of excellence. Our shower and bath enclosures offer change, combined with vast alternative	design. When elegance and style are blended with progressive ideas, and	new technology, the result is a product line which is unequaled. We are	confident that in your search for a product line which offers value, quality,	luxury, and design, you will find none finer then Blossom Hill Shower Doors. Finest Materials: When choosing Blossom Hill Glass Products, you are assured of a product	which is manufactured from the finest materials available.